Kyren Wilson's only previous appearance in the last eight of a ranking event came at the same tournament two years ago. 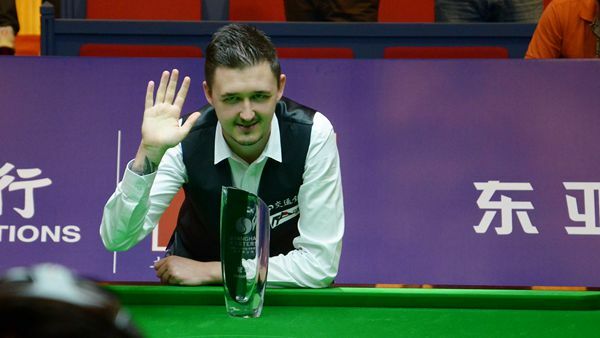 Qualifier Kyren Wilson held off a superb comeback from Judd Trump to win a thrilling Shanghai Masters final 10-9 and claim his maiden ranking title. Wilson had never previously been beyond the quarter-finals of a ranking event, but went all the way to the £85,000 top prize at the Grand Stage in Shanghai. At 54th in the world he is one of the lowest-ranked players to win a full ranking title in snooker history. Dave Harold holds that record having been 93rd on the list when he won the 1993 Asian Open. Wilson started the final full of confidence after following up wins over Joe Perry, Michael Holt and Ding Junhui with Saturday's 6-1 semi-final thrashing of Mark Allen. The underdog won three frames in a row to take a 7-3 advantage but world No 7 Trump was in no mood to give in as he searched for his first title since last year's Australian Goldfields Open. A break of 115 reduced the deficit to 7-4 and, although Wilson won the next with a 68, Trump came back to trail by only one frame at 8-7 and seemed to have the momentum. Wilson made it 9-7 before Bristol’s 26-year-old Trump made 89 and 60 in getting to 9-9. But, despite his lack of experience at this level, Wilson remained calm and made a brilliant match-winning 75 in the decider. Wilson said: "It's every player's dream to win his first ranking title. It will always stay in my memory. This is my breakthrough, just like Judd had his when he won the China Open. "I felt like crying at the end because it means so much to me. It felt as if it was slipping away from me, so to pull through in the end was just a relief. The fans were fantastic and the noise will live with me forever."